Basically these symbols allows the brain to rewire itself so it can function in accord with the shapes viewed so you can function more holistically about the cosmos, your self and ALL that Is. However you may decide to view up to 3 times a day, no more than 15 minutes so that you can give the brain the ability to assimilate. This fits the best absorption rate and alteration of circuitry. If you do more, you could lose the effects. See these symbols as an individual being and facilitator promoting an active communication with your brain. You will find time more malleable, flexible. You will be more in synchronicity, especially with the symbol called flow. You will catch glimpses of other realities that have meanings for you, illuminating you more clearly. These help in remembering, reawakening, recalling, and illuminating your path this lifetime. You are forming a relationship with a sentient tool, an aware being, an autonomous being, it will begin to talk to you. Understand these symbols as beings. These structures are like skeletal x-rays of nature spirits. They are archetypal aspects of your collective consciousness. Work and play with them. They will talk with you and tell you what you need to know because they are patterned along the lines of your neuro-circuitry. The circuits can be transmitted to another person. We are creating more silica in our bodies to pick up on these “antennas” to gain entrance into other dimensions and tap into vortexes. Anytime you lighten yourself up, you make yourself more capable of processing higher frequencies. Making statements rather than questions open doorways for more information. Asking a question does not open those doorways like a statement does. The plank plank is the actual weave of spirit reality. 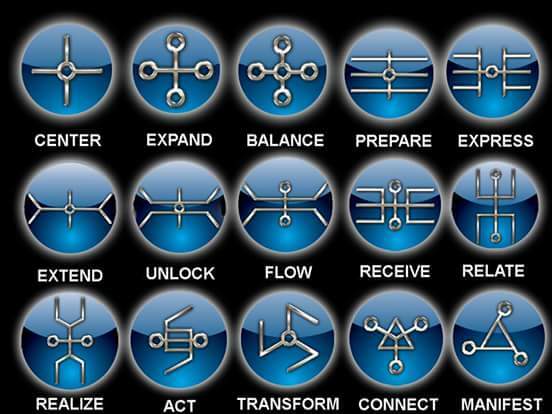 NOTE: Allow yourself to feel the different states of each Symbol, feel the activation of these states, observe and absorb each symbol as you go through them.